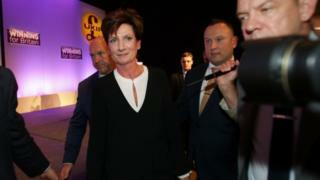 UKIP is holding a fresh leadership contest after the recently-elected Diane James unexpectedly quit after 18 days in the post. Her replacement will be announced on 28 November. With nominations closed, who's running? The former UKIP deputy chairman launched her bid for the leadership saying she would make the party less "toxic" and aim to occupy the "common sense centre" ground. She told the BBC she would "pour oil on troubled water" after there had been "a bit too much testosterone" in UKIP". Ms Evans was unable to compete in the last leadership election because of a temporary suspension, now lifted, after an internal dispute. A former Conservative councillor, she defected to UKIP in 2013 and is credited with presenting a softer, less abrasive side to the party. She wrote its 2015 election manifesto. But she is also mistrusted by sections of the party and accused one-time contest rival Raheem Kassam (who pulled out shortly before nominations closed) of seeking to take the party too far to the right. Paul Nuttall sees himself as the man to "bring the factions together" in UKIP and believes he has "huge support" among both the grassroots and the top of the party. The ex-party chairman, former deputy leader and Bootle-born MEP did not stand for the big job in the summer, reportedly because of the effect that it would have on his family life. But launching his bid this time around, he told the BBC: "I felt that with Brexit that my job and Nigel's job was done and we could hand over to the next generation. "That doesn't appear to have been the case and maybe it's time for someone who's an older hand in many ways." He said UKIP needed to come together as it was currently "looking over the edge of a political cliff". "I want to be the candidate who will tell us to come backwards," he said. "We need a strong UKIP there in the background to ensure that Brexit means Brexit and I believe that UKIP can become the patriotic face of working people." The former soldier announced he'd be running for leader on Daily Politics. Mr Rees-Evans describes himself as "a patriot who believes in the innate common sense of the British people." He has not previously held an elected office - his attempt to win the seat of Cardiff South and Penarth at the 2015 general election resulted in a third-place finish. Another former leadership contender, Elizabeth Jones came last in the previous contest to replace Nigel Farage. Deputy chair of the party's Lambeth branch, she stood unsuccessfully in May's London Assembly elections and came fifth in last month's Tooting by-election. The family law solicitor is a member of the party's national executive committee but decided not to run this time around. A previously less well-known figure in Westminster circles, Lisa Duffy, a town and district councillor in Cambridgeshire, came second in the last leadership contest, with 4,591 votes out of 17,970. She won the backing of key modernising figures in the party such as Suzanne Evans - who was unable to take part in the contest due to a suspension - and MEP Patrick O'Flynn, for whom she is chief of staff. Ms Duffy is a former mayor of the town of Ramsey, and as campaigns director played a key role in fighting by-elections. She joined UKIP in 2004 and stood unsuccessfully against Labour's Hazel Blears in Salford in the 2005 general election. A former chief of staff to Nigel Farage, he left his role following a bout of infighting in the wake of the 2015 election and has been editor of the London edition of the Breitbart website. He hit out at what he described as "chicanery and duplicity" at the top echelons of the party and pledged to campaign for a "strong, united UKIP free of Tory splitters". He said he was the man to continue Mr Farage's legacy inside UKIP but pulled out of the contest shortly before nominations closed, claiming the top of the party was treating the contest "like a coronation", criticising his treatment by the media and saying he had not raised enough money to run anything beyond "a digital campaign run from SW1". Holding one of two UKIP seats as a London Assembly member, David Kurten sits on the transport, housing and environment committees and the education panel of the Assembly. Announcing his candidacy, he insisted UKIP remained a "vital force" in British politics and has vowed to "not rest" until the country is built up again after decades of "embracing destructive ideologies of political correctness". Before starting his career in politics, he was a chemistry teacher for 15 years. He pulled out of the contest the day before nominations closed on 31 October. Andrew Beadle was UKIP's parliamentary candidate for Bermondsey and Old Southwark in the 2015 general election. He lost out in the Wallington South by-election of the same year. Mr Beadle said that UKIP "needs a full time leader not a part-time caretaker" and wants to drive the party forward with its "potential" and "staggering ability". Announced he was pulling out of the contest on 26 October. A Conservative activist before joining UKIP in 2011, Mr Etheridge has called for major reform of the penal system, including restricting prisoners' privileges, banning visits during the first six months of a sentence and an automatic 10-year increase in sentence for anyone attacking a prison officer. He has also called for far-reaching changes to the tax system, including a 50% cut in alcohol and tobacco duty, replacing VAT with a local sales tax and gradually merging national insurance and income taxes. On 25 October he announced he'd be abandoning his leadership campaign. The 49-year-old barrister was a front-runner in the contest - but withdrew, and resigned from UKIP, after a row with party colleagues. Mr Woolfe was taken to hospital after the clash with fellow MEP Mike Hookem in the European Parliament, with the two men giving conflicting verdicts on what happened. He was previously the bookies' favourite for the job, vowing to make UKIP "the main opposition party", to stand up for the "ignored working class" and to bring about a "radically different political landscape in Britain for a generation". But he will now see out his term as an independent MEP. The party's culture spokesman and most prominent gay representative has dropped out of the race to succeed Diane James. He previously told the the BBC UKIP was "not going anywhere soon" and insisted it was "here to stay". On 4 November Mr Whittle recommended that his supporters back Paul Nuttall instead, saying: "UKIP needs a leader who knows the party inside out and who can command the loyalty of members across the board." Neil Hamilton: The former Tory minister, who is leader of UKIP in the Welsh Assembly, has said he has no interest in becoming leader under any circumstances. Mr Farage, who has a fractious relationship with Mr Hamilton, has said this would be a "horror story".